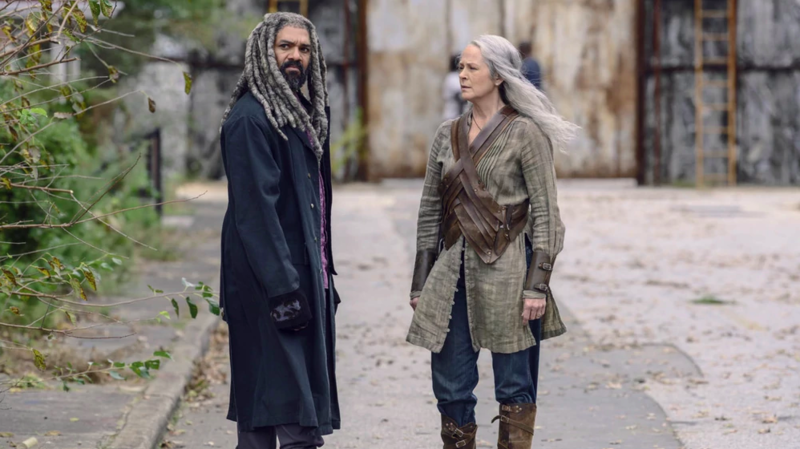 The Walking Dead Season 9, Episode 15 'The Calm Before' Review – AiPT! The fair at the Kingdom is underway, with all four communities coming together in celebration for the first time in years. Last week, we took a deep dive into Michonne’s past, giving us some much needed background on her current isolationist viewpoint (and why it was tragically justified). She also had a bit of an epiphany courtesy of a powerful talk with Judith. This week, we see if the aforementioned epiphany results in Michonne being more like she was before Rick Grimes disappeared…and if maybe Michonne’s suspicion of everyone outside the gates of Alexandria was actually justified. The episode opens with a random couple in the woods celebrating their one year anniversary with some zombie slaying and discovering Hilltop. We then flash forward 5 years later, where the same random couple has become a part of the community and are even more in love than before. For their 5 year anniversary, the woman gives the man some handmade jewelry with an ‘H’ for Hilltop engraved on it. She also promises to trade the rest of her Hilltop charms for an even better anniversary gift at the big fair, which they are heading out to attend. About the only thing missing to mark this couple for death were a couple of red Star Trek uniforms. What you probably did not see coming (at least I certainly didn’t) was that it would be in the next scene, which featured Alpha singing a song to her missing daughter while carving off the woman’s skin. At the Kingdom, Ezekiel gives a genuinely rousing speech to open the Fair of New Beginning, buttressed by the giant model of Shiva standing beside him. The joyous festiities get even better when Connie, Daryl, Lydia, Henry, and Dog return. Unlike the anxiety and eye rolls that normally accompany an appearance by Henry, Carol is filled with relief and happiness at seeing her adopted son. Even better, Michonne and Judith have come along too, making for an exceptionally happy reunion all around. There’s certainly no way all these good vibes are leading up to something terrible happening, right? Anyway, Lydia’s presence (and Michonne’s surprise appearance) results in hastily called meeting of town leaders. Alexandria decides to give Lydia asylum, which Tara is definitely not happy about. In a major role reversal from the season up until this point, Michonne makes a solid case for showing humanity toward the former Whisperer. After convincing Tara to be cool, she also proposes a mutual protection pact among the communities, which they all agree to. This allows Ezekiel to get out his fancy looking charter for all of them to sign, once again creating more good vibes and making even infinitely more nervous about how bad things are going to get by the end of the episode. Back at the fair, Henry and Lydia walk around like nervous teenagers trying to figure out who’s going to initiate the first make out session. Keeping with the you love theme, Enid awkwardly calls Alden (ex-Savior guy) her boyfriend, a label that he awkwardly (and happily) agrees to. Okay, these good vibes are getting to Icarus-levels of danger. Even when Kelly gets mad at Connie for leaving without saying goodbye, the moment quickly turns into a tender embrace between siblings, all but ensuring an incoming massacre. Our first bit of true conflict begins when Addy, the girl Henry liked before, starts talking to him…which leads to her flirting with him…which leads to Lydia observing their interaction and looking like she wants to tear Addy’s skin off. Making matters worse, some of Henry’s douchebag town friends decide it’s the perfect time to surround Lydia and menace her a bit–which is a pretty laughable thing to try with someone who was raised by Alpha and grew up surrounded by people wearing walker skins. When the Douche Brothers also imply that Henry likes Addy (and that she likes him), Lydia finally decides she’s had enough and storms off. Later, Henry finds Lydia and confirms that she has nothing to worry about because he’s all about her. He then gives her a kiss and says he’ll see her at the movie before heading to check out a broken pipe or something. Meanwhile, Rosita meets up with Eugene and kindly reminds him that even though his feelings for her will continue to be unrequited, they can still be friends. Eugene takes this in stride, although he just about blows it by inviting her to an RPG game that evening. But there are much more important things to worry about than all these heart warming stories of love, forgiveness, and acceptance…like the fact that Alpha is wearing the dress from the woman who was killed at the beginning of the episode and wandering around the fair. She meets Ezekiel and claims to be from Alexandria, which he has no reason to suspect since he hadn’t seen anyone from that community a forever (and that she acts/speaks like the type of people you can often run into at Walmart if you ever go there after midnight). A little later, Alpha enters the theater and sits down next to Lydia in Henry’s still empty seat. She then takes Lydia outside and accosts her for being accosts her for turning on the Whisperers (and her), but Lydia stands her ground. Alpha leaves, angry and dejected. A group including Daryl, Carol, and Michonne heads out to make sure the Hilltop is safe from the Whisperers (since that’s the community Alpha really has it out for). They end up finding the Highway Men, who have found the random couple (along with some others) who were butchered by Alpha. The group makes the classic mistake of splitting up to advance the plot search for survivors. (Also, Magna and Yumiko kiss, which felt like it was supposed to be some sort of revelation, but I thought we already knew they were a couple). The group with the most main characters ends up roaming the woods at night (super smart), which leads leads to them being being surrounded by walkers. After defeating the horde with a very poorly choreographed/edited fight scene, the Whisperers show up along with Beta, who somehow managed to make it out of the elevator shaft from a couple weeks ago. As you might imagine, he’s not too happy to see Daryl again.Alpha then saunters up and claims that she doesn’t care about her daughter anymore (yeah right), but she does care about showing the communities what’s up. Alpha takes Daryl a long walk, leaving the others behind. As the sun comes up, she forces him to the edge of cliff overlooking to a MASSIVE sea of walkers, which she claims is being steered by her Whisperers. After she and Daryl trade barbs over their divergent leadership/life philosophies, Alpha reveals that the rest of the group he was captured with are fine. She also warns him that if any of his people cross into Whisperer territory again, she will unleash her horde on them. Speaking of the aforementioned territory, Alpha lays down some very specific boundaries, which she says are marked by a border that Daryl will definitely see on his way back home. She ends the conversation by saying that she doesn’t think his people can protect her daughter. Daryl disagrees and walks away. If all this seems far too reasonable for someone like Alpha, you’re absolutely right. After letting Daryl and his group go, Beta tries to comfort Alpha about Lydia. She responds by asking to be left alone. Once Beta is gone, she begins to cry. Out of the corner of her eye, she spots a Whisperer observing her rare moment of human weakness. To ensure his respectful discretion, she calls him over and stabs in the head. Meanwhile, as Daryl’s group heads back to camp, they find Siddiq bound to a tree, bloody and completely in shock–and apparently the only one left alive from a group that had been captured and spirited away by the Whisperers over the last day. After being untied, he stammers and shakes while leading them to Alpha’s border, which consists of various minor supporting characters’ zombified heads on pikes…along with the heads of Tammy, Henry, Enid, and Tara. The episode closes with Siddiq telling the gathered communities about how Alpha left him alive to tell the others about the Whisperers horrific act and scare them. Instead, he tells about what happened after the Highway Men found and freed them. Instead of running their separate ways, the ragtag group of people (many of whom barely knew each other) fought like hell for each other until the very end. He implored everyone to continue to doing the same for each other. Later, Daryl takes Lydia out to the border, where she lays down a necklace emblazoned with the Hilltop emblem in front of the now empty pikes. This episode was all types of awesome, so let’s get the nitpicks out of the way first so we can dive back into the good stuff. The fight scene in the woods was horribly shot/edited. It wasn’t made entirely clear how all the murdered characters were captured (Whisperers posing as townspeople to infiltrate the fair). So many good vibes during the first 2/3 of the episode ensured we all know things were going to take a very dark turn by the end. We never got to see Eugene in the dunk tank. Other than that, ‘The Calm Before’ was an absolute gem, and not just because of the ending’s shock value. That visual alone–the heads of so many familiar characters moving their mouths in undead vacancy–would have been enough to warrant a certain amount of praise. But the horror and heartbreak that scene provided was earned on multiple fronts, from minor character arcs (Enid and Alden falling in love) to major ones (Michonne’s finally learning to trust again). You can almost feel Carol’s soul shattering at the revelation that she was unable to protect Henry. The episode’s two codas were both extremely powerful (even to a cynical long time viewer like me). Siddiq’s speech, juxtaposed beautifully against a scene of the murdered characters, was fantastic. It’s the type of moment that could have easily felt cheesy, but actor Avi Nash handled it brilliantly. And how badass was that final shot of Enid putting up her fists for one last stand? The episode’s final (and wordless) moment was equally moving–Daryl’s protective presence remaining beside Lydia despite the tragedy that’s followed her, watching has she paid her respects while sharing in her new family’s grief. Combine all that with what a fantastic (and different) type of villain Alpha has become, and Season 9 of The Walking Dead has brought the show back to a level of quality we haven’t seen in a long time. All that being said, curse this show for making me upset about Tara’s departure. A few seasons ago, I would have been happy to see her bite the dust. Now, just as she’s morphed into one of my favorite characters, she’s gone. But at least Henry’s gone too, so it almost evens out. A brilliant episode that earns its horrific and heartbreaking conclusion. The shocking conclusion was totally earned, both over the the course of the episode and the latter half of the season. Alpha continues to prove herself to be a very different (and arguably better) class of villain than this show has had before. The episode's two poignant codas are beautifully executed. All the good vibes make the episode's tragic ending feel somewhat inevitable. The episode's one major fight scene was very poorly shot/edited.